This morning MD and I have another crack at the Forest Rec Parkrun where I am surprised to bump into a colleague from work. I knew his lad was in the field but this is the first he’s been over to watch him. Then she heads off for the 11am and then on to Derby for a spot of grave cleaning of her elder brother’s long neglected grave. I’m at the match where Derby are slightly fortunate to beat Reading 3-2 then later we’re off to Broadway Cinema. I renew our Broadway membership as we head into the Oscars season as we do like to see all the nominees. Our first set of ‘free’ tickets goes on Jackie. 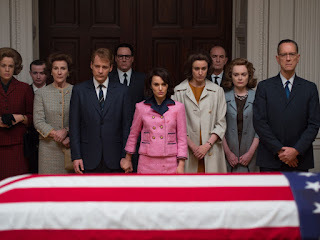 Jackie follows Jackie Kennedy (Natalie Portman) during the days after her husband's assassination in Dallas in November 1963. Moving backwards and forwards in time, the film mainly revolves around the interview that she gave to Theodore H. White (Billy Crudup) for Life Magazine. In flashback we see her recording a televised tour of the White House in which she appears nervous and almost shy. This is in complete contrast to her demeanour in the interview where she appears much more confident and even controlling. Throughout the interview she attempts to set the record ‘straight’ about herself and her family while basically telling the reporter what he can and can't write about her. Right down to saying she doesn't smoke while she sits there smoking a cigarette. We also see her planning a grandiose funeral for her husband against the wishes of the secret service but mostly we see her wandering around the White House in a moribund state of grief. The primary aim of the film seems to be an exploration of her state of mind and sadly the actual story becomes a bit of a side show. The film is clearly trying to make points about her character but I feel like I'm sat in a lecture theatre being taught them. 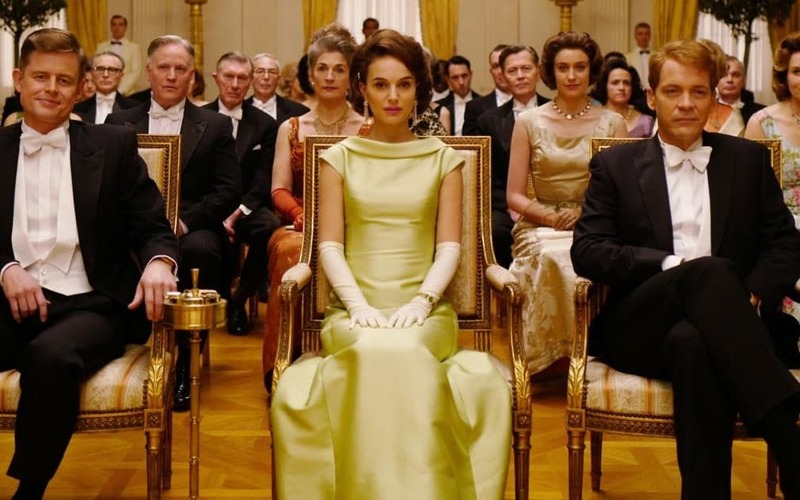 This focus on the one character also means that Natalie Portman becomes basically the entire film and she has clearly spent some time learning every last nuance of Jackie Kennedy's mannerisms. She appears to succeed at this, totally immersing herself in the character, so much so that she becomes an absolute clone of Kennedy. For me though this isn’t really acting, it’s just impersonating. 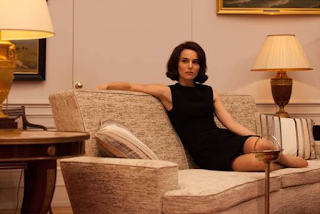 We know Portman can act but she isn't really allowed to here. Kennedy also comes over as quite artificial, incredible vain and a bit of a cow if I’m honest. I certainly didn’t feel any sympathy for her. I actually came out of the film actively disliking her but then I wasn’t that familiar with Jackie Kennedy beforehand as many people won’t be. This is another problem with the film, its assumption that you know a lot of the background history, not just about the assassination of JFK but also about the Kennedys in general and the ‘Camelot’ myth. As we are going back over fifty years here that quite an assumption. Particularly if you're not an American but then when have US film makers ever assumed anyone wasn't American? The movie isn't bad and director Pablo Larrain skilfully blends archive material with re-enactments but it’s really not very entertaining and drags at times. A wider focus, perhaps covering more of Jackie Kennedy’s later life, would have made things much more interesting. After a Centurion in Broadway, we move on to have a couple in the Scribblers and then a couple more in the Blue Monkey.